While I love the Houston Symphony Orchestra's concerts at Jones Hall during the classical concert season, I also love when they periodically show some of the great classic films on a big screen with the HSO playing the score of the film as it is showing. The fetching Mrs. B and I have loved some of the past films like Indiana Jones, The Wizard of Oz, Back to the Future, etc. as our great orchestra played flawlessly the score of those films as it was showing. These have been great events, not just to see some great classic films on a big screen, but also to hear our great Houston Symphony Orchestra at the same time. This weekend at Jones Hall is a film that is a natural for the score to be played by a symphony orchestra, as the classic film itself was made in 1940 with some of the great classical music pieces in it for the direct purpose of introducing classical music to young children [and adults who hadn't experienced classical music before]. 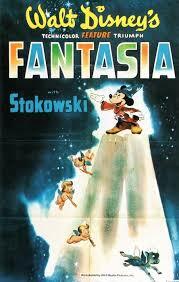 This masterpiece animated film by Walt Disney is "Fantasia". The music in this film was performed by the Philadelphia Orchestra conducted by Maestro Leopold Stokowski [who ironically was the music director for the Houston Symphony from 1955-1961]. While the most famous and recognized piece from this film is Paul Dukas' "The Sorcerer's Apprentice", when Mickey Mouse turns into a magician using his magical broom, this film contains 7 other great pieces of classical music [from Wikipedia]: Toccata and Fugue in D-minor by J.S. Bach; Nutcracker Suite by Pyotr Ilyich Tchaikovsky; Rite of Spring by Igor Stravinsky; Beethoven's "Pastoral" Symphony; Dance of the Hours by Ponchielli; Night on Bald Mountain by Modest Mussorgsky; and Ave Maria by Franz Schubert. This weekend's film will have our Houston Symphony Orchestra playing the live score with Principal POPS Maestro Steven Reineke conducting. Turn up the volume and listen to just some of the great music from Fantasia that will be played in Jones Hall this weekend as the film is shown on the big screen.